This section holds no ordinary Sacred Geometry, but jaw dropping information that needs some time to sink in before one can comprehend the meaning of it. This is Profound Sacred Geometry. We will provide a basis of Sacred Geometry through the knowledge of the flower of life, and it is advisable to read that first before going into the more profound section with the explanation of the Fibonacci sequence and how it is intertwined with the system of time that we use. A lot of people have already heard of sacred geometry and the special meaning it gives to life and our existence in general, but a lot of people also wonder where this all comes from and how it stands in relation to the creation of everything. Very good question! I was asking myself the very same question for a very long time so after doing some research I came across a mind boggling study. I promise you, if you read all the way through this article, your jaw will simply drop in awe!! Also, take some time to contemplate in this information after you have read it. It changed my perception on all that is! One of the greatest scientific discoveries ever made is Einstein’s theory of Special relativity in which Einstein theorizes that space and time are intricately linked in what has been termed ‘Spacetime’, part of Einstein’s famous discovery is his formula E=MC2. E=MC2 states that Energy is equal to mass at the speed of light squared, simply stated this says that energy can be converted to mass and vice versa at the speed of light squared. Implying that energy and mass are actually the same thing. The recent discovery or hype regarding the Higgs Boson or God particle theorizes the exact same thing. When physicists at CERN smash particles at close to the speed of light they find traces of the Higgs Boson, this is a theoretical particle that gives mass. So, once again, at the speed of light Energy and Mass are the same thing or are equal. E=MC2. Einstein’s discovery is one of the greatest ever made and has been proven. But the world has never really understood exactly what it was that Einstein had discovered, we know that Einstein was right. Space and time are intricately linked. Physicists have been so focused on the space part or rather the material part of the physical world that they miss the most crucial aspect of this discovery. Space and time are the same thing. Space is TIME and time is SPACE. Spacetime. But according to Einstein and Higgs, ENERGY and MASS are also the same thing at the speed of light. Mass is the physical universe, it’s the things we see out there, the stars, the planets, all physical objects have mass. So energy is equal to mass at speed of light. And time and space are the same thing. So, is it fair to say that energy is equal to time or energy and TIME are the same thing? Since space and time are the same thing and energy is equal to mass (space). This is the crux of my argument. The universe is in fact not a physical object. It is not a place or a thing. The universe only exists in TIME. It is only an EVENT. The universe is something that is happening over time. It is the conversion of energy to mass and mass back to energy over time. There is no outside the universe because the universe is not a physical thing. Think of it as a story, an event. Something is happening over time. If you can accept that energy and time are indeed linked then I can show you exactly how the physical universe comes into existence using time (energy) as the building block of the physical universe (mass). If you can’t fully accept this right now then bear with me and see where I am going with this. At this point I need to make another statement: All mass, that is all physical objects have geometry. That means all physical objects have some kind of shape. If you break any object down into its microscopic parts or atoms you probably have spheres, this is what science predicts at the very least, inside an atom we have electrons spinning around the nucleus at nearly the speed of light creating a tiny little cloud or sphere. This is the conventional idea of what an atom is although we have never really seen an atom. We have seen the atomic bond structure through the atomic force microscope but we’ll talk about that later. For now, all mass has shape or geometry. When physicists at CERN smash atoms together at close to speed of light they find traces of the Higgs Boson, they find a theoretical particle that gives mass to objects. Something magical happens at the speed of light, energy and mass are the same thing. Exactly as Einstein predicts. Now, how does TIME create the physical universe? This is really how does energy create the physical universe. Since I say energy and time are the same thing. This is the magic. What do we know about time? From our very first ancestors to this day, what do we understand about time? How do we record time? How do we keep time? Time is a circle. We calculate one day by the spin of our earth on its central axis. We calculate a year from our earth’s rotation around the sun. We calculate a month by the rotation of our moon. Granted all of these times are not absolute, some months are longer and some years are longer, all depending on the ellipse of the orbit. The point being that we first calculate TIME using a rotation or CYCLE. There are better ways of keeping time. We have wrist-watches or clocks that can keep accurate time. Look at a clock. What do you see? A circle with hands that rotate over and over again. But what about digital time? This is not a circle right? We have numbers on a digital watch. Those numbers also run in cycles. They keep cycling through a fixed loop. So really, one unit of time is always one cycle of something. One day, one year, one second, one nano-second. Time is a circle or recycling of 1 unit, 1 fixed measure. There is a fundamental problem with the way our watches work. When we look at a clock we see that a clock face is divided into 12 hours, each hour into 60 minutes and each minute into 60 seconds. The problem is that nobody knows for sure why we use these units. Our ancestors used these units and we adopted these units but we don’t know for sure why. We do know that the Ancients (The Babylonians and Sumerians) considered the number 60 to be very important. So we have broken our 1 day cycle. That’s the 24 hours it takes for our planet earth to rotate once upon its central axis. We have broken those 24 hours into 2 halves, day and night. Each half has 12 hours. We see this 12 hour unit on our clock circumference and we have further divided these 12 hours into 60 minutes and 60 seconds. Yet we don’t know why. Next we need to talk about a famous mathematician named Leonardo Pisano Bigollo better known as Fibonacci. Fibonacci discovered a famous sequence of numbers known as the Fibonacci sequence. The story is that he discovered this sequence of numbers as he was investigating how rabbits multiply. Since Fibonacci’s discovery, this sequence of numbers have been found in many aspects of nature. It is a famous pattern in nature. But there is something else that happens in this famous pattern of numbers. This pattern found in nature. If we look deep into the sequence (which computers have done) we find that this sequence of numbers forms a 60 digit repeat cycle. After every 60 numbers in the Fibonacci Sequence, the last digit in each number starts to repeat, it starts to recycle. I have listed the first 72 numbers in the sequence and highlighted the last number in red. Notice that after the first 60 numbers (0-59) the last number starts to repeat. This 60 number pattern repeats all the way into infinity. You can research this online. 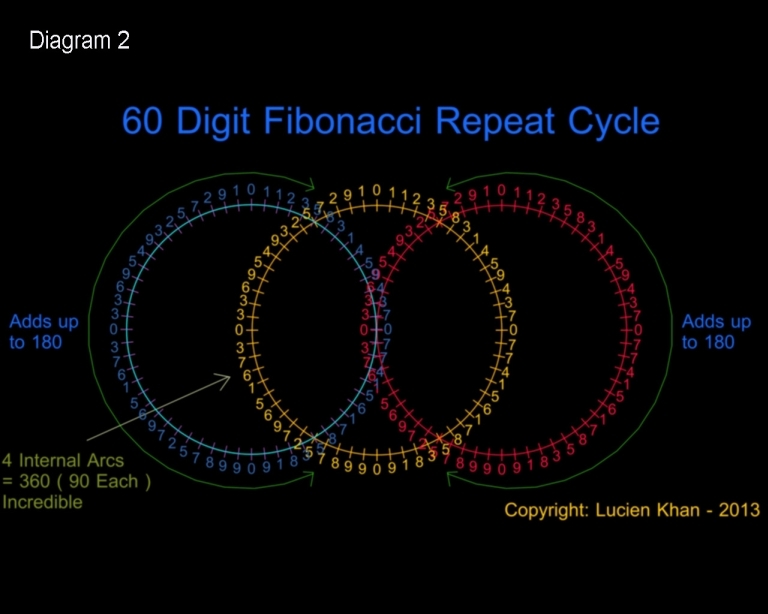 So, here in the Fibonacci sequence, a famous sequence found in nature, we have a CYCLE of 60 digits that repeats to infinity. Exactly like the 60 seconds on our clocks. If you watch the second hand on a clock those 60 seconds will recycle over and over until the battery runs out. But when you using the Fibonacci Sequence these numbers can run into infinity and this 60 digits will recycle into infinity, it needs no external source of energy, it needs no battery or someone to wind the watch. So in mathematics we have a reliable clock built into mathematics. We have 60 digits that repeat into infinity. An important point to note is that this 60 digit repeat cycle only exists when you use base 10 mathematics as we do here on earth. Now, here on Earth, I have a perfect cycle of time created from an eternal or rather infinite source in mathematics. Important to note here that even though the last numbers in the Fibonacci Sequence recycle into infinity, the overall sequence keeps growing or getting bigger and bigger as you count higher and higher, time is only moving in one direction. This is exactly what would happen if you sat staring at a clock. The minute and hour hand would appear to be going around and around every 60 minutes, but you know that it’s not the same hour simply repeating itself over and over, time is in fact going forward. First it would be one hour, then 2 and so on and so on into infinity. Here is the amazing and totally mind-boggling part. In fact it is so incredible you can’t even grasp its full meaning because it seems so MIRACULOUS. If you take the 60 digit repeat cycle from the Fibonacci sequence and place those numbers around the circumference of a circle as you would with a clock this is what you will find. There is so much information pouring out of that single image that you cannot properly appreciate it all without deep contemplation. The things that stand out immediately is that the 4 zero’s from the 60 digit repeat cycle align perfectly with the 4 cardinal points on a compass, marking out our North, East, West & South. Then you will see that the number 5 in the sequence together with the zero’s perfectly mark out the 12 hours on our clock-face. So not only does the Fibonacci sequence provide us with a 60 digit cycle, this same cycle seems to perfectly indicate our hours on a clock face and mark out the 4 cardinal points on a compass. That alone in incredible. But if you study this image even more closely as I have done. You will find that if you add up the sum of the numbers on the left hemisphere you get a total of 152 and if you add up the sum on the right hemisphere you get a sum of 128. The difference between the 2 hemisphere separated by the central axis is therefore 152 – 128 = 24. There is another way to derive the number 24, if we add up the total sum of all those numbers in that cycle the total sum is 280. There are 8 “5’s”. If we treat those 8 number 5’s as zero’s since they mark out the hour marks like the actual zero’s we would have 280 – 40 = 240. 240 is a base 10 harmonic of the number 24. 24 x 10 = 240. Our planet earth takes 24 hours to make one complete rotation on its central axis relative to the sun. This Fibonacci 60 digit cycle provides me with the 60 digits (seconds or minutes), it marks out the 12 hours on our clocks and it tells me that if I split it along its central axis the difference will be 24. Believe me, you cannot fully appreciate what this means. I suspect that the ancients did not use 60 units on a clock by pure chance. They must have had instruction from a higher intelligence or they knew about this Fibonacci cycle and somehow that knowledge of “why” has been lost. Forget about how they knew this for a moment. You need to ask yourself how can the Fibonacci sequence be doing this? How can mathematics be creating a perfect clock that only applies to us here on earth. Remember the Fibonacci sequence will be the same no matter where you go to in this universe, mathematics is a universal language. But only here on earth will the Fibonacci sequence create a clock that so perfectly matches our human clocks. We humans can and do speculate on whether or not there is other life in the universe. We say if there are so many billions of stars and planets out there, then there must be life on other planets. That’s pure conjecture; we don’t know this for certain. Yet, here on Earth, where we know for a fact that there is life. Here, the Fibonacci Sequence creates a clock that perfectly denotes our units of TIME. Here on earth where we use base 10 mathematics. Let’s move on. I don’t think anyone can easily grasp the meaning of what I’ve just said without deep contemplation. You need to lay down and close your eyes and ponder what it means. So now we have a clock. Using only mathematics I have a circle broken into 60 units. The clock clearly marks my 12 hours and the difference between the 2 hemispheres produce my day of 24 hours. Earlier I said that the universe is created only in TIME. It only exists inside time and is not suspended anywhere in SPACE. In other words there is no place called the universe there is only a TIME when the universe happened. The universe is not infinite in size but only ETERNAL in nature, meaning it lasts forever. Just like counting numbers, you could start now and count into infinity. Now, how can the physical universe come into existence using only TIME? Because we do see a physical universe surrounding us. Let’s get into it. I have my clock that runs into infinity. Let’s think about this clock as my basic building block. My atom. Remember the physical universe is made up of atoms that we think look like microscopic sphere’s. SPECIAL NOTE: At this point we have to discuss the “Big bang” and what science knows about the universe. I can’t explain the whole Big Bang theory to you. Read up on it. This is so important, we live in this universe, you need to familiarize yourself with the world you live in. Read Stephen Hawking’s “A brief History of Time” or Bill Bryson’s “A brief history of nearly everything”. Big Bang theorists say that once there was nothing (no universe) then we had a singularity event and the entire universe came into existence. They say the universe first rapidly expanded faster than the speed of light in what is called ‘rapid inflation’ and is now still expanding (After having magically slowed down). They imagine the universe ‘like’ an inflating balloon or a loaf of raisin bread expanding in an oven. They say the galaxies are now all flying apart so if we run the tape backward everything must have been tightly compressed in the distant past, they imagine this highly dense tightly compressed infinitesimal point exploding into the massive universe we see today. That’s the basic theory. The theory is based on what they can see through our telescopes and what we know about space and the universe. You see when we look out into space we are only looking backward in time. No matter what direction you look in, you are only looking back in time. When we look as far back as possible we see a uniform almost empty universe, nothing existed. But then suddenly we had a whole lot of hydrogen. The universe is full of hydrogen. Hydrogen is the most basic atom on the periodic table; Hydrogen has one proton and one electron. This balances the electrical charge, so that the hydrogen atom is electrically neutral. But there are NO neutrons in a hydrogen atom. The proton is the nucleus. This is really the first thing we can detect when we look back in time, the Big Bang says there was a singularity event and all the hydrogen was created. It doesn’t really say how. I won’t get into all the things that are wrong with the Big Bang theory right here. Let’s stick to the science. First we had nothing then we had hydrogen. The most basic atom or building block in physics. These hydrogen atoms start to collapse or gravitate toward each other, this causes it to get excited and heat up, stars are born. Stars later explode in a supernova and all the heavier elements are formed. This is a really rough summary. We, the carbon that makes human beings, is formed in the star dust after a super nova. So science says we are made from stardust. (BTW- Thats not the only place you will hear that we are made from dust). So thats it. When we look as far back in time as possible all we detect is hydrogen. The most basic building block. I will show you an image of the Hydrogen atomic structure later. I don’t want to give too much away right now. You will be amazed. Back to my explanation of creation using TIME and numbers. So now I have my first basic building block, my circle of time (My hydrogen atom if you will). But the Fibonacci sequence doesn’t just produce 1 circle. It produces an infinite number of these circles or cycles, like billions of building blocks. Mentally compare this to the young universe full of hydrogen. To create anything I must put these building blocks together. Right? The physical universe is made up of atoms that are grouped together to form matter. Let’s see what happens when I start to put my building blocks together. Remember my building blocks are little circles of time. How do you logically combine 2 circles? I think you would logically join them at their centre point, their nuclei as it were. You could think of them as little solid balls or spheres but then they wouldn’t join at the nucleus or centre, think about 2 tennis balls in your hands, when you bring them together they can only touch on the outside, on the circumference of the spheres. That’s because they are solid balls. But we don’t have that yet. We have no solid or physical matter. We only have our cycles of time. As soon as I join my first 2 building blocks at their central point’s I have a very famous image. This image is called a Vesica Piscis and this image has been revered throughout human history. Please don’t sit there and think this is all speculation. This is not like the theory of the Big Bang where I make statements that you cannot individually verify. Right from the start you can pick up your calculator and confirm everything I’ve said. Obviously you cannot confirm the existence of the Higgs Boson, but I didn’t claim to have found the Higgs Boson. You can confirm everything “I” am saying. You can research the other claims about the historical relevance of the Vesica Piscis or E=MC2. Anyway, back to the building blocks of creation. I have now joined 2 building blocks and immediately I have the Vesica Piscis. Once again if we study the image above we find an iceberg of hidden information. Please bear in mind that we are dealing only with mathematics here. We are working only with numbers and not with any physical objects. The circles are circles of 60 numbers. Not physical circles. Numbers are not real objects; they exist in the ether or in the mind. The physical universe has not come into existence yet, we are as yet only working with intelligent consciousness. When I join the 2 circles of 60 numbers I get another one of the greatest numbers in ancient civilization. After I combine the 2 circles the sum of the numbers now left on the outside add up to an incredible 360. The inner arcs each add up to 90. The total sum of all the numbers would now be 270 + 270 = 540. The 2 sets of “5’s” cancel each other out as you can see from the image. If you know a little bit about human history you would laugh at how incredible this is. It’s like a miracle. Remember I told you that we use 60 seconds and 60 minutes on our clocks but we don’t know exactly why. Well, we also use 360 degrees on the circumference of a circle but we cannot say exactly why. We know our ancestors used these units and we adopted their systems. One of the most famous ancient historical sites is Stonehenge. Studies suggest that Stonehenge was originally a circle of 60 stones arranged in a 360 degree circle. The Kaaba (the Cube) in Mecca was originally surrounded by 360 idols. The belief is that these idols must have represented the days of the year. That’s what our modern day scholars think. They think our ancient ancestors used 360 because our year has almost 360 days in each cycle. Look at the image above. We use 60 and 360 and these numbers just happen to pop up in the Vesica Pisces. Let’s stick to the mathematics for now. We combined 2 circles of 60 and we got 360. 60 squared or rather 60 x 60 = 3600. This is another base 10 harmonic, 360 x 10 = 3600. The inner arcs each add up to 90. These numbers are hugely significant to any person who knows mathematics and geometry. The total sum of all the numbers are 540. 540 is a base 10 harmonic of 54. 54 x 10 = 540. All verifiable. One of the oldest written languages is the Sanskrit language. Sanskrit has 54 letters, each letter has masculine and feminine aspects, shiva and shakti. 54 times 2 is 108. We are starting to move into some very important spiritual numbers here. I can only urge you to research the numbers 60, 360, 54, 72, 108, 216 & 432. But I’m getting ahead of myself right now. For now just note that when we create the Vesica Piscis we start to see the number 54. The Vesica Piscis was very important to the people in India where the Sanskrit language originated. For that matter, our very mathematical system originated in the eastern world. You’d think that was it right? I’ve sapped all the information I possibly could out of this image of the Vesica Piscis. No. And I beg anyone reading this to do their own studies of this image. Maybe I’m missing other important information here. There’s something else I found. 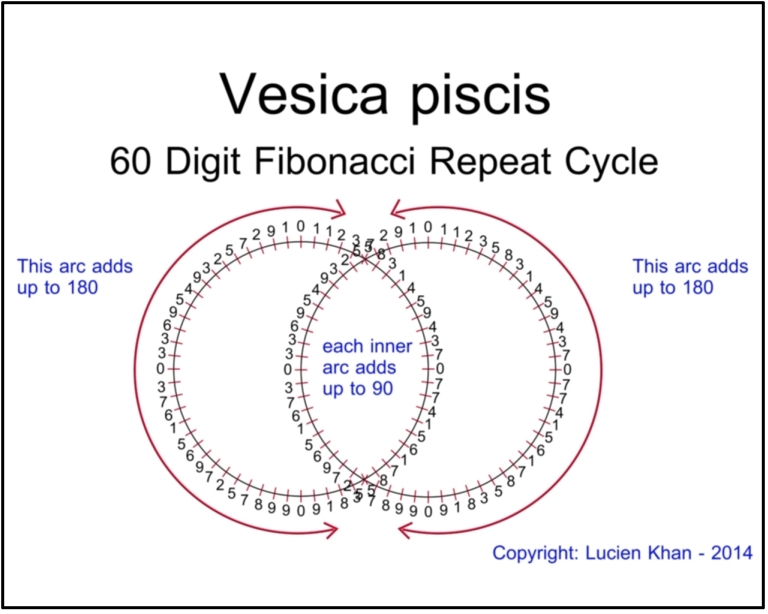 In this image of the Vesica Piscis there are 2 sets of 60 numbers. 60 + 60 = 120. But there are 8 zero’s in total. So we could say there are really only 120 – 8 = 112 numbers. But look again, the four “5’s” cancel each other out, so now we have 112-4 = 108 numbers. This is really like magic. We have 108 numbers that add up to 540. Each circle provides 54 numbers. These circles join and produce the numbers 360 and 540. The Sanskrit language has 54 letters each letter has a masculine and feminine aspect, shiva and shakti. If I can be a little creative here. It’s like we have a male circle and a female circle joining to create the Vesica Piscis. When I join the male circle and the female circle I give birth to a new image that has the numbers 360 and 540 prominently featured. We are still only working with numbers. Not physical objects. There’s still something amazing in that image. I won’t mention it right now. Maybe you can see it. It’s really important. I’ll come back to it later. At this point we have to discuss something else we know about the physical world. In a way we are reverse engineering the universe, we know what the end result is and we are trying to explain how it came to be. We know that the universe manifests in all 360 degrees. We can see it in all 360 degrees. We call this 3 dimensional space because there are 3 planes of existence; in mathematics we call these 3 axis, XYZ. But in reality there are really 6 directions. When you move from the central point of an object you have 6 directions. We call these 6 directions, UP, DOWN, LEFT, RIGHT, BACKWARD & FORWARD. 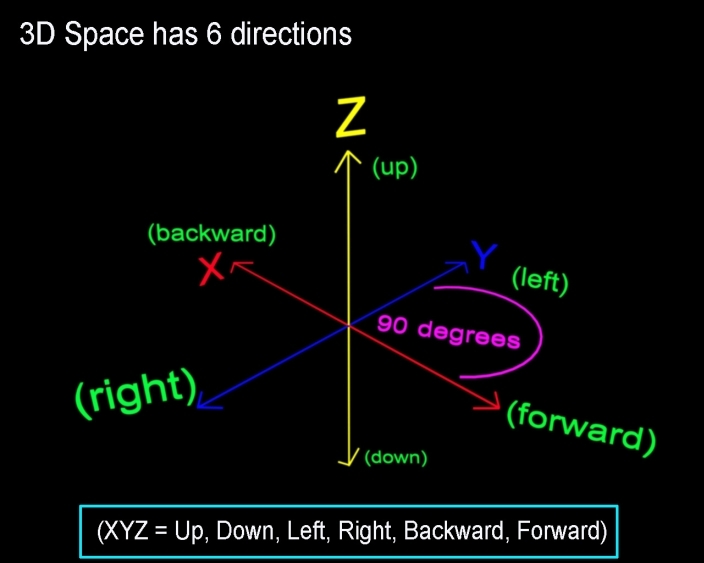 These 6 directions are combined to form the 3 coordinates XYZ in Euclidean 3d Space. As you can see we have XYZ which are the 6 directions (Up, Down, Left, Right, Backward & Forward). And if you look at our Vesica Piscis above you can see that the inner arcs add up to 90. I must point out here that the numbers in the Vesica Piscis are still only mathematical. They are not degrees of angles in a physical object. The sum of the numbers are simply 360 and the inner arcs are 90 each. Sum of numbers, not degrees of angles. But note the symmetry between physical space and these ethereal numbers. We are still working only on a level of consciousness and not in physical space. We still have only circles of TIME or intelligent energy. But when I combine these ethereal circles I start to see some very significant numbers. Let’s continue to combine our building blocks or circles (Our atoms of time). This is the result when I combine 3 circles. Once again you can see that these circles of 60 numbers are producing the number 360. There is a clear pattern developing here. The 4 inner arcs that now add up to 360 (90 x 4 = 360) consist of 72 numbers. Thats 18 x 4 = 72. The reason I am mentioning this is because in certain ancient religions it was believed that there are 72 angels or 72 names of God. We’ll talk about that later. I just wanted to mention to you that 72 is also a very important number. And here, as soon as we have 3 circles of TIME. A trinity of circles if you will allow me. We start to see the number 72 pop up. And not just any 72. We have 72 numbers that add up to 360. Physical space (The Universe) exists in 360 degrees and some people believe God created the physical universe. They also believe God has 72 names. Incredible. God is thought to be an eternal super-intelligent entity, like our numbers. If we continue to add our building blocks on the points where our number “5’s” intersect, since these are now our new zero points, we will end up with one of the most sacred images from the ancient world. This is incredible. (Get used to the word incredible). I can’t overstate just how incredible this is. If you’ve ever played Sudoku or created a magic box you might have a small idea of just how amazing this is. But lets discuss what is happening here. First we had our 1 circle of time. A circle that clearly marked out a day here on earth. We had our 12 hours and our 24 hours if we split the central axis. So let’s say we had our 1 circle which was our 1 day. Here in this image we now have 7 days. I don’t want to point out the obvious here but I really have to. In religion we are told that God, which is an eternal, super-intelligent entity, created the universe in 6 days and rested on the 7th. We also have 7 days in our week. This image you now see is a famous image in the sacred world. This image is called the “Seed of Life”. That name implies that it is the seed from which life is born. If you don’t know about the Seed of Life you really should do some research. I can’t adequately convey to you just how sacred this symbol is. The Flower pattern you see being generated is so mathematically perfect it is beyond words. But I must try to communicate this to you. Each part of the flower consists of 108 numbers and the sum of those numbers are 540. Start with the green flower in the centre, there are 108 numbers that add up to 540. This flower blossoms into the yellow flower which has 108 numbers that add up to 540 and lastly the yellow flower blooms into the pink outer flower which has 108 numbers and adds up to 540. This is all still only mathematics. 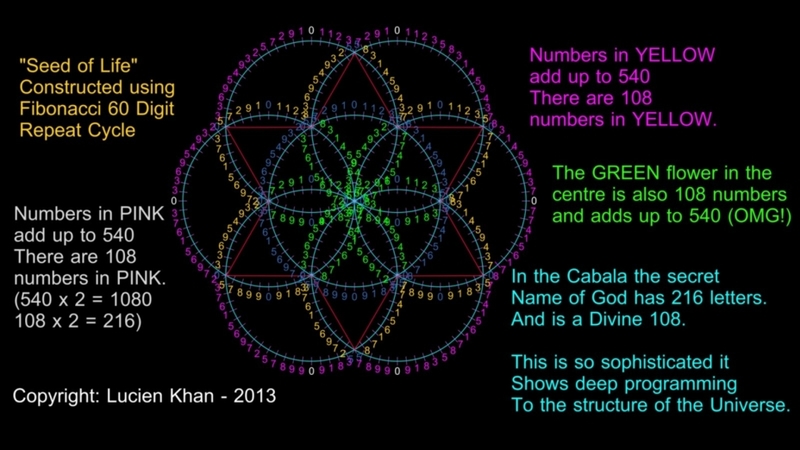 Using numbers we have created the Seed of Life. I don’t need any tools to do this. I don’t even need a compass. The numbers themselves run in cycles of 60 and I can join the cycles where the 5’s intersect. This is a purely ethereal structure that can be conceived in the intelligent mind or consciousness. To me it seems as if the ancient people knew something about this. They may not have had all the information or maybe most of it has been lost of jumbled, but there really seems to be a link to ancient knowledge and to what I have found using these circles of TIME. I’m getting ahead of myself. We don’t have a physical world yet. All we have is a pattern of numbers that up to now existed only in the conscious mind. How does this conscious energy manifest into the physical world? I will continue to draw parallels between what science observes and what I say in happening in mathematics. In science we have atoms that are the basic building blocks of matter. We don’t see these individual atoms but if we study them using advanced technology like the Atomic Force Microscope we can see the bond structure between these atoms. Once atoms become grouped together they form visible matter, the visible physical world that surrounds us. In mathematics we deal with numbers that exist only in the conscious mind. When we look at these numbers in the Fibonacci Sequence we see that these numbers form cycles of time. Once I start to combine these circles of time I start to see patterns, as soon as I get to 7 circles I start to see a distinct flower pattern commonly known as The Seed of Life. From invisible circles I am starting to detect form or structure. Not life or reality just yet, but I am starting to see the Seed of Life. The thing that will give birth to life. Once again I cannot overstate the importance of the hexagon. You will see this pattern appearing over and over again in the physical world. At this point I will urge you to pay attention when you are watching television, look at the lights in the background, look at the starlight, you will see this six point light and hexagon patterns in the natural and stage lights. 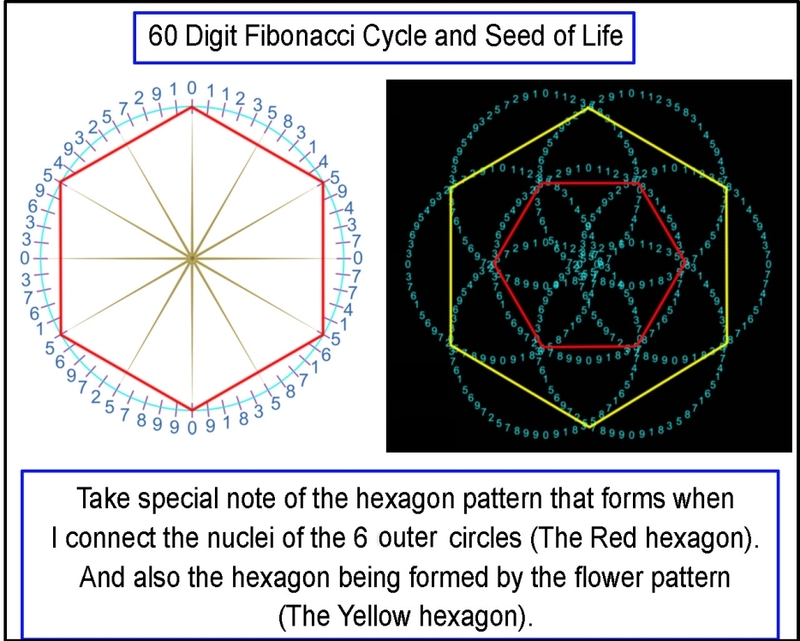 The reason I mention this hexagon is because once we get to 7 of our circles of time connected at their nuclei they form this larger pattern known as the Seed of Life. There is now a relationship between these seven circles. If I draw straight lines connecting the nuclei of the 6 outer circles I get a hexagon. These 7 circles are now bonded together in this larger pattern. First we only had ethereal cycles of time (circles). Now we are starting to see distinct secondary geometry or shapes starting to form. These shapes are in fact there in the original single circle of time, if we connect the zero’s and certain 5’s as you can in the image above, these shapes are already there, they become more evident or VISIBLE as I combine these circles and connect them by their nuclei. When I discussed the Big Bang earlier I mentioned that in the beginning all we have is hydrogen, these hydrogen atoms collapse under the force of gravity, their atoms gets excited, this causes them to heat up and our first stars are born. This is really the first “thing” we can see, this first starlight or heat, this is the first thing that becomes visible. I also said there is an image I would like to show you regarding hydrogen atoms that you will find incredible. Here is that image. We have never seen single atoms, but when we study hydrogen (The most basic atom) using an Atomic Force Microscope we see the bonds these atoms form. And look at the BOND structure. Here we start to see our hexagonal pattern. That pattern is just a relationship or force that exists between atoms. In my theory, I have these invisible or ethereal circles of time. When I combine the nuclei of 6 of these circles I start to discern a hexagonal pattern or relationship between these circles. I start to detect secondary geometry. Maybe no physical objects just yet, but distinct shapes or patterns, however ethereal. NOTE: I am not saying my circle of time is a hydrogen atom. I am drawing parallels to what we see in the physical world with my explanation of how the physical world becomes manifested or visible. I say that the physical world does not exist “anywhere” but only in TIME. You will not be able to go outside this universe and look at it. It does not sit in “space”. It has no external shape but is only a cycle of TIME. An event. 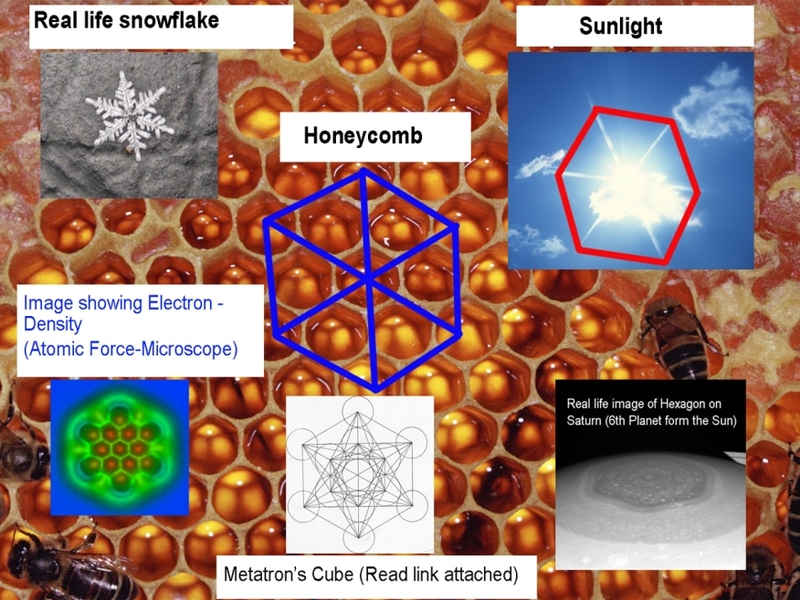 Here are some more hexagons found in nature. You will see them everywhere, even on Saturn. We are moving from the invisible (numbers), toward form (geometry), toward what we “see” or call real. All we have to do is follow the growth pattern. As things become bigger they become more visible right? More tangible. More “REAL”. If we add another 6 cycles of time onto our Seed of Life pattern we create yet another famous design or pattern from the ancient world, namely Metatron’s Cube. Metatron’s Cube is said to hold all the secrets to the universe. There are numerous books and online websites dealing with this subject. Please research who Metatron was and what Metatron’s Cube is. The subject is too vast to cover here. I’ll go over the crucial stuff, relative to this discussion. 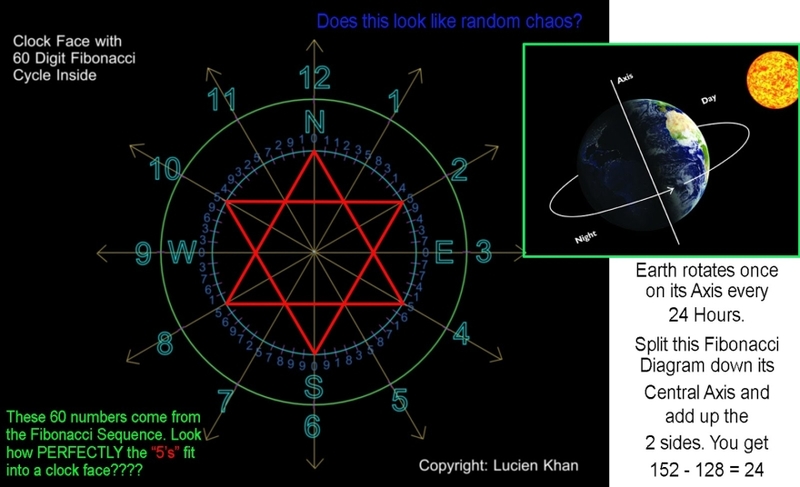 Let me address one discrepancy between the previous image of the Seed of Life and this image of Metatron’s Cube. If you look at the Seed of Life you will see that the 7 inner circles intersect at their nuclei or centre point. Here in Metatron’s Cube the circles are touching on their circumference. I have not skipped a step. The Seed of Life becomes Metatron’s Cube. The Seed of Life grows into Metatron’s Cube or rather Metatrons’ Cube is embedded into the Seed of Life pattern. There is a blossoming, a growing, or movement that happens here. You must bear in mind that I am trying to explain creation from a starting point using a single image of the Seed of Life constructed with 7 cycles of time. But in reality, there are an infinite number of these cycles of time, there are an infinite number of building blocks that already exist. These 60 digits in the Fibonacci sequence recycle for all eternity. We are in essence stopping time at a single interval of 60 and looking at the circles. But between intervals the numbers grow or count to the next 60. Play this video and pause it at about 12 seconds. Imagine that you now have an infinite grid of these circles. Play the video again and pause it at about 24 seconds. Here you can see what the pattern would look like when the circles all intersect at their nuclei. You have an infinite grid of the Seed of Life or Flower of Life extending in all directions into infinity. Now if we isolate only 7 of those building blocks or cycles we would see the image of the Seed of Life that I posted above. This is what is known as a fractal pattern, it is a pattern in which every single part has the same properties as the whole. Okay. So if we isolate 7 cycles we have the Seed of Life. If we add 6 new cycles to the Seed of Life we get Metatron’s Cube. Play the video again and pause it close to the end at about 49 seconds, here you can see how Metatron’s Cube is embedded into that pattern. Play this video a few times just to see how the Seed of Life grows into Metatron’s Cube or how the 2 are embedded into that infinite pattern. 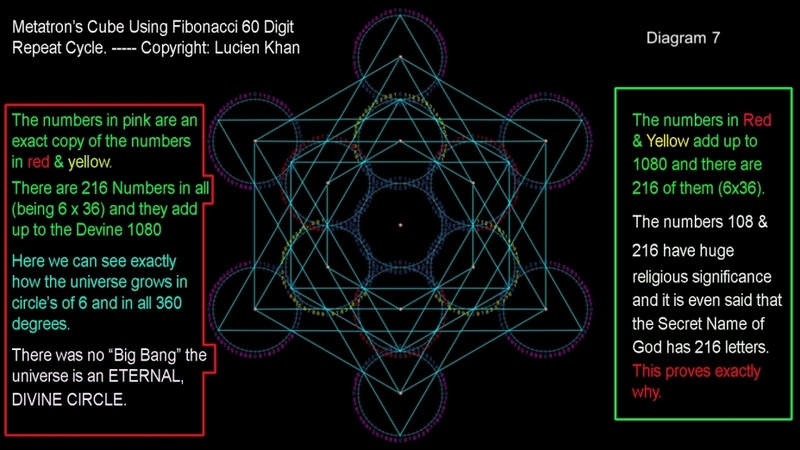 We have isolated 1 Metatron’s Cube out of a fractal pattern that extends into infinity, using only Mathematics. So there is an ethereal, infinite world of mathematics and in that sea of numbers we have isolated first our 1 cycle, then our 1 Seed of Life and now our 1 Metatron’s Cube. It is believed that Metatron’s Cube holds all the secrets of creation. Why is that? Lets study it and see what the numbers tell us. First of all we see that the Flower pattern has once again expanded, but something very important has happened here. The numbers have doubled. 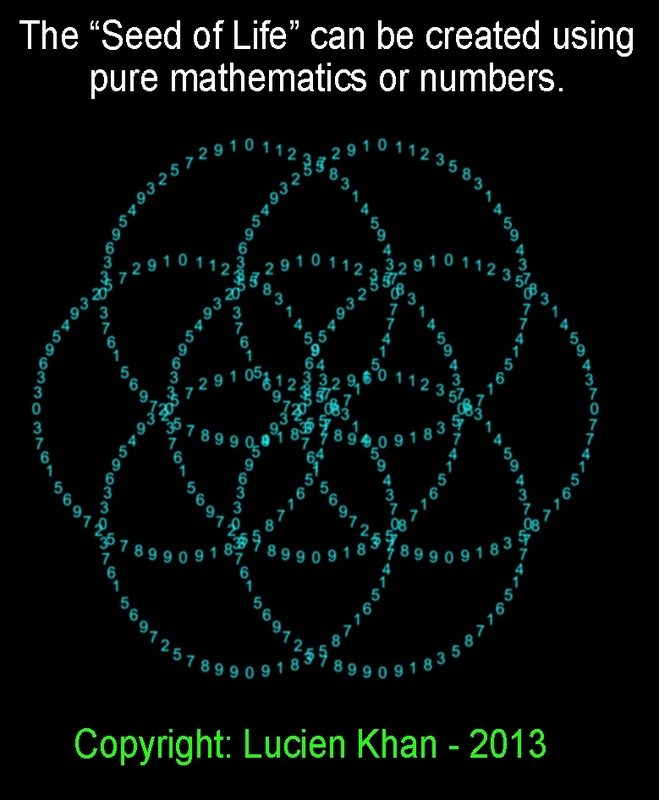 In this flower pattern in Metatron’s Cube (See image above) we have a set of 216 numbers that now add up to 1080. In the Seed of Life we had 108 numbers that added up to 540. So the entire thing has doubled in sum. 108 x 2 = 216. And 540 x 2 = 1080. Once again certain numbers are being generated here that have huge spiritual or mystical connotations. In the Ancient Kabala (Kabbalah) it is believed that the secret name of God has 216 letters. (The 72 names of God where each name has 3 characters 3 x 72 = 216). How can I fully convey to you how incredible it is to find a 216 number pattern hidden here inside Metatron’s Cube? This is the point where we move from something that only exists in the conscious mind to the physical world or rather to what we perceive as being the physical world. Here is the point where we move from energy to mass. Remember though that energy and mass are really the same thing at the speed of light. At speed of light energy and mass are equal. When we slow things down, we see physical matter or mass. When we study infinitely tiny particles in laboratories at CERN we can see that energy and mass are equal. When the particles become bigger we cannot speed them up to near the speed of light anymore. In Metatron’s Cube the sum of numbers in the flower pattern double. First we had only a single circle of time. Then we had the Seed of Life which flowers (grows) into Metatron’s Cube where the sum of the numbers are directly proportional to the sum of the numbers in the Seed of Life. The sum is double that of the Seed of Life. This directly proportional relationship is very important in the physical world. The reason that many people revere Metatron’s Cube and call it Sacred Geometry is that they believe that all 5 Platonic solids can be found inside Metatron’s Cube, when it is viewed as a fractal. The 5 Platonic solids are considered to be the building blocks of all physical matter. Those are the 5 Platonic solids. Some people would say there are actually 6 if you add the circle or sphere. Interesting that there should be 6 fundamental shapes to all geometry. Plato identified the solids with the elements commonly believed to make up all matter in the universe. In Plato’s times, people believed that all things were made up of five different atoms. So now, here in Mathematics (Numbers) using only our circles of TIME, we have created Metatron’s Cube, and in Metatron’s Cube are contained all the geometry that make up the physical world. The stuff we see. I must confess here that although this image shows all 5 platonic solids fitting inside Metatron’s Cube this is not totally honest, in order for the Dodecahedron and the Icosahedron to fit you need to understand that Metatron’s Cube is a fractal and you need to imagine it in 3d space. (There are many video’s and images on the internet explaining this). For me it is good enough that the Hexahedron (Cube), the Sphere & the Tetrahedron fit so perfectly into Metatrons’ Cube. Once we start to build 3d space all the other shapes come into existence. I demonstrated how the Hexagon is created by joining the nuclei in our circles of TIME. This is really the meat and bones of my theory. Using these circles of time I have showed how we move from imaginary numbers, numbers that exists only in the intelligent conscious mind into form or pattern and then into 3d space. You need to understand what is happening here. The physical world is only an illusion created by the LIGHT. Remember energy and mass are the same thing at the speed of light. When we slow things down, only then do we see a physical world. But in “REALITY” everything is simply energy. My argument is that energy and TIME are equal. And time is a circle. We calculate time using repetitive cycles. Each cycle is a fixed unit. We start to add these units up using mathematics or numbers. What does that mean? To put it simply, we live inside a MATRIX of numbers. You may think that is impossible. But look at the images on your television or on your computer. Everything you see on your computer is constructed using only numbers. On your computer we use a binary code of one’s and zero’s. In mathematics or in the infinite sea of numbers I have shown that there are circles of time. These circles are the basic building blocks of what we call “reality”. And I have shown how these circles of time produce the numbers we use in our geometrical angles, the number 360 for example. But I have also shown a very important step, when the Seed of Life blossoms into Metatron’s Cube, the sum of the numbers instantly double. The Seed of Life is directly proportional to Metatron’s Cube. If you study physics or do some simple research you will find that almost every major force in the universe is either directly proportional or inversely proportional between objects. The gravitational attraction force between two point masses is directly proportional to the product of their masses and inversely proportional to the square of their separation distance. The force is always attractive and acts along the line joining them from their centre. Now apply that definition of gravity to what we just learned about these circles of time. Quantum tunnelling or Quantum Leaping. When physicists study atoms on a quantum level they find that the electrons in atoms tend to blip in and out of existence. They disappear from one location and reappear in another location without ever seeming to cross the space in between. They simply phase in and out of existence. If I remember correctly. I think it was Stephen Hawking who suggested that they might even be disappearing down an infinitely tiny black hole and reappearing a fraction of time in the future. It was even suggested that these tiny black-holes must therefore exists all around us. The reason I mention that is because “numbers” do exactly the same thing. And we are after all drawing parallels between what science is finding in the real world to what I say must be a matrix world. How do numbers disappear and reappear? Well, how do we move from one number to the next? If you are counting from 1 to 10 for example. How does 1 become 2 become 3 and so forth? Numbers in fact move at the speed of light. That is why I say energy and time (cyclic numbers) are exactly the same thing. If we study numbers on a quantum level, like physicists study atoms in the physical world what do we find? So I have to break my number down into its quantum parts, how does 1 become 2 become 3 and so on. If I break the number 1 down, between 1 and 2 that is, I will find it goes 1.99999999……… ad infinitum. I could go all the way into infinity and I will never reach 2. To reach the number 2, I must move at the speed of light. I must jump in and out of reality, I must go from 1 to 2 instantly. So is it fair to say that numbers move at the speed of light? Mathematics or numbers are God. They are the intelligent energy that create all things. I think I have shown convincingly, or at the very least, I have demonstrated reasonably enough, that the physical universe is constructed simply using numbers. You don’t have to believe what I am saying, but please consider it, that is all I can ask. I said I would show that God created the universe. What do we know about God? Put all the individual religions aside or put them all together if you want. What do they all have in common or what do they tell us about God? God is an eternal, super-intelligent force or energy that creates all things. What did Einstein shows us? Einstein showed us that everything is made out of energy. So all matter is made out of energy. We know this now. Is it really so far-fetched to think that that all pervading energy is intelligent? That that energy has a purpose to what it is doing? All I am saying is that the nature of that intelligent energy is mathematics. That energy creates a matrix using mathematics, we exist inside that matrix. We are made in the IMAGE of God. We are a reflection of that intelligent energy. If we are made from that energy is it not okay to say that we are the product of that energy, we are the children of that intelligent energy. We are the children of God. There was something else I wanted to tell you about the Vesica Piscis, I wanted to wait until we got past Metatron’s Cube. You must please read my other pages where I fully discuss the numbers in Metatron’s Cube. I have found a pattern of 216 numbers that form a flower pattern. In the Kabala it is believed that the secret name of God has 216 letters. Now, there is one other thing science knows about the physical world. We know that the greatest force in the universe is electromagnetism. This is a polarising force, energy moves from one pole to another along an electromagnetic field. If we look at our own earth we find it is surrounded by an electromagnetic field. This field is partly responsible for sustaining life on this planet; we certainly would not be here without it. Light itself is an electromagnetic wave. And, if you look at the Vesica Piscis you will start to notice something else. And remember this is when we put our first 2 basic building blocks together. I told you there is a ton of hidden information there. This is when you will first notice it, but it becomes more apparent as we add more and more building blocks, it certainly there as soon as we add the 3rd circle of time. And now if you scroll back up and look at our image of the Vesica Piscis, you can see, as soon as we put 2 circles of time together we start to see a torus shape forming, these numbers not only form circles of time but when put together they form an electromagnetic circuit or pattern. It’s there is the Seed of Life and in Metatron’s Cube. Why did the ancients believe that Metatron’s Cube holds all the secrets to the mystery of the universe? We’ve seen that once we get to Metatron’s Cube we start to see all the geometry of the physical universe starting to form. As soon as we put 2 circles of time together the sum of the numbers surrounding those 2 circles (the electromagnetic pattern) was 360. You need to understand the sheer brilliance of this. The sum of numbers in an imaginary or conscious realm of existence is precisely equal to the degrees of angle in our physical world. The one is giving birth to the other. Numbers are creating the illusion of reality. This is not the end. There is so much more we need to learn. I believe the answers are all hidden here, in these pages. NOTE: You need to turn the conventional image of Metatron’s Cube 90 degrees (or even 30 degrees) to see the electromagnetic pattern. (I am working on what this means right now). What is our purpose? I don’t know. What I do know is that the universe is a super-intelligent creation. It is not random chaos. Once we accept that God is real or that God (A super-intelligent force) creates all things, we will move forward in leaps and bounds. I may sound anti-science at some points, but I have huge respect for the scientific process and mind. God is everything. We need to put philosophy, science, art and religion into one collective study to understand all things. If I am later proved right in what I am saying here, I certainly could not have known all this without all the great artists, scientists, philosophers, mathematicians & spiritual leaders who came before me.